Ideally, at least, that's what they do. 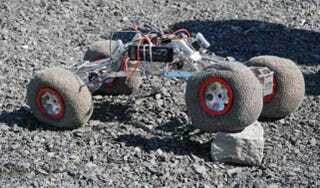 In practice, they have to deal with low gravity, uneven surfaces, and lots of grit. The iRing provides a new way to do it. No one's saying the wheel wasn't a great invention. Whoever thought it up should be very proud. The problem is, it often doesn't work very well without another invention; the road. Anyone who has played Oregon Trail knows how often a broken axle or some other wheel-related catastrophe delayed people and made them starve to death when winter set in and they were caught in the Sierra Nevadas. Until roads were widespread, the wheel was of limited utility. On the moon, there are no such roads to be found. Some researchers from McGill University found a way around the alarming paucity of lunar development. Instead of wheels being taut rubber, which is energy efficient but can't get much of a grip on large obstacles, they're loosely-filled circular sacks of pebbles. The sacks droop down and enfold any obstacle, giving the vehicle purchase on large obstacles. The outer sack is made of chain-mail, making it puncture-resistant. Obviously it takes more fuel to glom along on sacks than roll on rigid wheels, but the moon's low gravity will help. The researchers are getting a piece of 11.5 million dollars, dolled out to canny engineers by the Canadian Space Agency. These wheels also might be getting a bit of the $30 million Google prize for putting a vehicle on the moon. Photo: Brad Jones/Neptec Design Group.